Day 13: Kids Think Big, Do You? Giveaway Alert! If you have a young child in your life you will want to read to the bottom of the post and enter this great giveaway! ECO-ngratulations to Danielle, Slee, & Tracy! When my oldest was born a coworker told me how important reading was to children even as an infant. Our first book that we received (from this same coworker) was The Very Hungry Caterpillarby Eric Carle. Thus began our love of reading together. As a very young child he enjoyed being read to. We made it our special time together as mother and son to read together every night. We will still (on most nights) read together before bedtime. Our collection of books is very diverse and includes many wonderful and well known titles along with some not so known titles. Now that he is older (yes, my baby is entering first grade in the fall) I continue to look for books that help mold the young man that he is becoming. It is amusing to see how ‘green’ he has become. It’s not unusual for us to be at someones house and he will ask them where their recycling bin is…and you don’t want to hear his response if you don’t recycle! I was so fortunate to find Jeanine Behr Getz, author of Think Green!, and we now have another great book in our collection. Think Green! is 32 pages of fun printed using soy based inks, printed on post-consumer recycled paper, processed chlorine free, and made in the USA. The age recommendations are from 3-8 but even us adults can learn a lesson or two from Millicent. As a great addition to Think Green! the book, Jeanine also offers a Think Green! Starter Kit for kids. This starter kit includes one (1) kid sized reusable shopping bag, one (1) green bracelet (made from recycled climbing rope), one (1) reusable napkin, and a sheet of post consumer waste wrapping paper. Along with the book, this starter set would make a great gift for your young child, grandchild, or school. Would you like your own Think Green! Starter Kit? Jeanine is giving away three (3) starter kits to three (3) lucky readers! All you have to do is enter! Contest is open to residents of US and Canada. I had the opportunity to speak with Jeanine about Think Green! and her passion for the environment. Below is my interview with Jeanine. 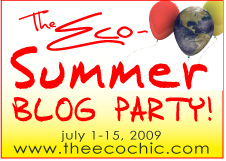 The Eco Chic: At what age were you when you realized your passion for the environment? Jeanine: When I was young I can remember leading a pack of kids every summer to clean up areas around our family’s summer camp and I always enjoyed being in nature but it wasn’t until I was an adult and had my daughter that I became passionate for the environment. I started to learn more about the impact we had on our earth and what we were leaving behind for our children. The Eco Chic: Do you feel that it is ever too early to encourage children to respect the environment? Jeanine: I believe it’s never too early to encourage children and never too late for adults to learn to respect nature, the environment and each other. The Eco Chic: What is an eco-audit? Jeanine: An eco audit, which appears on the back of Think Green!, is an environmental benefits statement that shows the reader how many trees, how much water, energy, solid waste and greenhouse gases Kids Think Big LLC saved by using post-consumer waste fiber vs. virgin fiber to print Think Green! on. Think Green!is the first children’s book to have an eco audit and we hope to inspire other authors and publishers to save more of our earth resources and follow suit and encourage discussion with children. These calculations were provided by New Leaf Paper and calculated by research by Environmental Defense Fund and other members of the Paper Task Force. Jeanine: When I first wrote Think Green!three years ago, “green” wasn’t mainstream yet, paper sources were limited and costs were not comparable to non green alternatives but printing green was the only direction for Kids Think Big. Through many hours of research we sourced a great USA printing company, Worzalla, that understood and could meet our “green printing requirements” and partnered with an industry leader for our paper, New Leaf Paper. 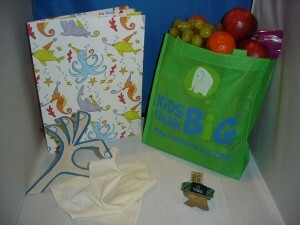 The Eco Chic: How can parents (teachers, grandparents, etc) use Think Green! to reach more than just their own children? Jeanine: Two ways – we have the KTB reading club – that is on our web site, www.kidsthinkbig.com that is for kids 9-12, they read Think Green! to schools, libraries, boy scout/girl scout troops and other groups and send us the pictures and earn great green prizes! We also ask anyone buying Think Green! that they share, or the person that they are giving it to share, Think Green! with their schoolmates, library or other community groups. Share the gift of reading and the message of Think Green! The Eco Chic: Any plans for another green book? Jeanine: Yes, I am working on two books now, both will of course be printed green, but one is on a totally different topic and the second is a “green” topic. Same age group and writing style and illustrator! We have had some great response from our preliminary market testing on both books. The Eco Chic: Thank you Jeanine for your time and for the wonderful opportunity to review Think Green! I wish you well with your new books and look forward to seeing them. I can’t wait for school to start back so that I can share Think Green! with my sons class this fall. The new ADA sport will help people have fun, relax, and enjoy themselves. Every day, masterpieces by the great ADA artists will bring people pleasure, happiness, and a unique entertainment experience.